Ever have an application upgrade go bad? Most have experienced this situation and wished that it could be undone. SANsymphony makes this wish come true through point-in-time volume snapshots. These snapshots can be used to revert a volume back after a failed upgrade, mounted to a backup server for backup operations, or used to offload data processing operations to a different set of disks. Snapshots can be leveraged in two ways. The first is a differential snapshot. This type allows for the volume state to be instantly captured and made available for use. The second is a full snapshot. This type makes a full block copy of the volume to a separate virtual volume (and separate pool if necessary). Snapshots also work in conjunction with VSS. VSS issues commands to the Windows application server to quiesce and flush all I/O thereby ensuring that the volume is consistent prior to the snapshot. As data is written to the production volume, before the write is committed in production, a copy of the original block is copied to the snapshot volume. This will maintain the original state of the production volume in the event that a rollback back is necessary. DataCore works with popular 3rd party backup products to simplify end-to-end data protection and ensure rapid data recovery at a granular level. Products from companies such as Commvault, Microsoft, and others take advantage of DataCore online snapshots to centralize backups for a wide range of applications, hypervisors, operating systems and storage devices. The combined solutions offload backups from the hosts to minimize the impact on applications. Consequently, backups can be taken more frequently to meet more stringent Recovery Point Objectives (RPOs) without compromising business productivity. Many of the steps typically necessary to coordinate snapshots for backups have been automated so they can be scheduled at regular intervals without manual intervention. 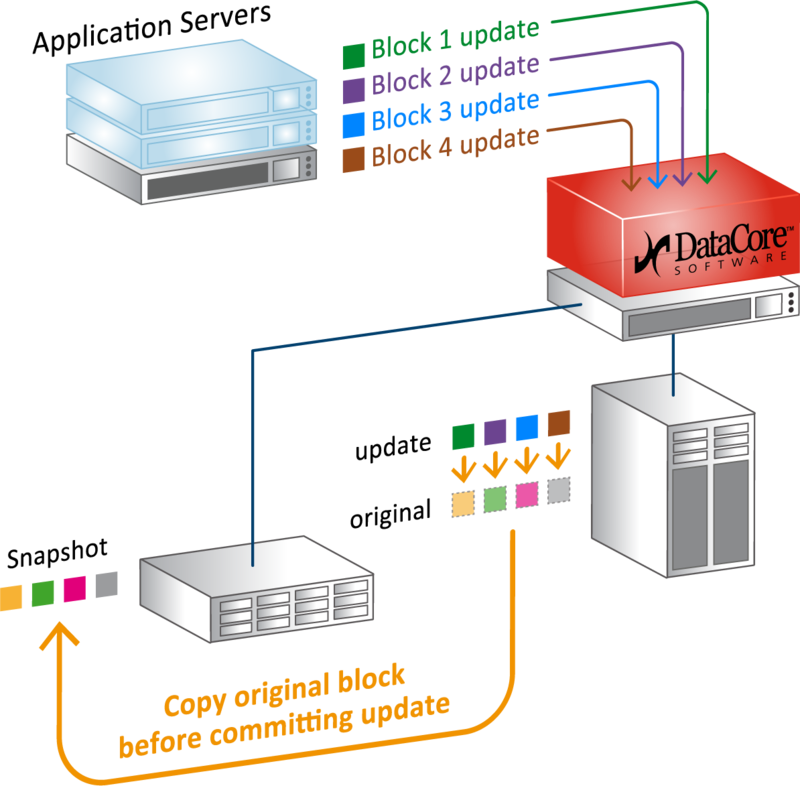 In addition to snapshots, DataCore offers Continuous Data Protection (CDP) for especially critical volumes. This option rolls back data to points in time between daily backups to quickly reverse the effects of malware, data corruption and user errors. It can also be used to repeat a missed backup. Talk with a storage expert to learn how DataCore can protect your business-critical data with zero-touch, zero downtime.